Politicians of virtually every political party bar the Conservatives have been warning all night that the Exit Poll must be wrong with statements such as that they would 'eat their hat' (Paddy Ashdown) and that during the course of the night the actual results would come inline with the opinion polls that painted a much tighter race. However, with 102 actual results declared by 3.20am, the BBC continues to maintain its exit poll seats per party forecast that puts the Conservatives on 316 seats, Labour on 239, Lib Dems on 10 and SNP on 58. Here are the results of the BBC seats forecast, Exit Poll, my forecast as of 28th Feb, and the last opinion pollsters seats forecasts. 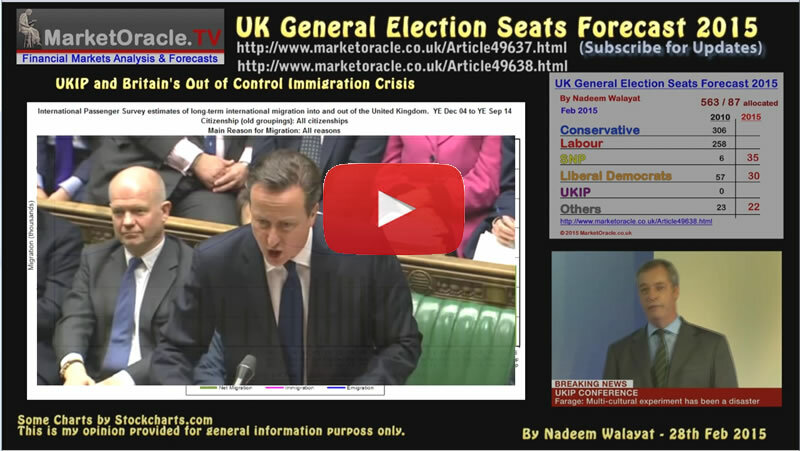 Therefore of the exit poll remains correct then as of 3.20am the Conservatives will win the 2015 General Election. The exit polls are precisely in line with my long-standing forecast as of Feb 28th for the continuation of a Conservative led government on 326 seats and with a possibility that the Conservatives could yet win an outright majority. Therefore virtually all of the pollsters have have eggs on their faces as the mainstream media has flushed untold millions down the drain on commissioning opinion polls that turned out to be WRONG just as the polls were wrong in the run up to the Scottish referendum that was never a 50/50 proposition which at the time I concluded was mainly so as to allow pollsters to sell opinion polls and the mainstream press to sell copy and so it has been for the 2015 election campaign. 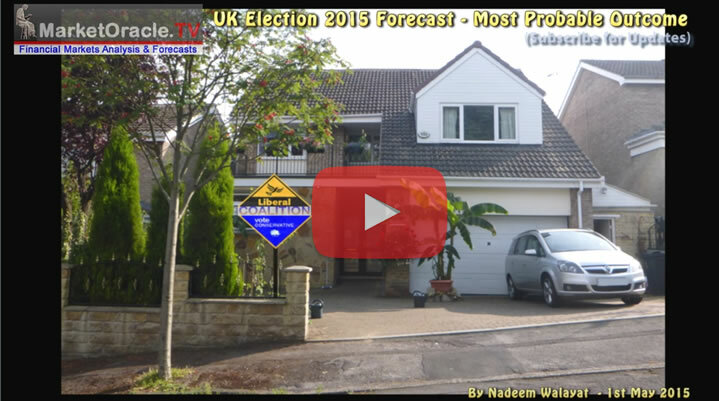 01 May 2015 - UK Election Forecast 2015 - Who Will Win? Momentum has picked up from February's +6.6%, to +7.7% for March, though has missed the headline grabbing new all time high in average UK house prices just prior to election day, probably due to ongoing weakness in house prices in the South East. Therefore the Conservatives mini election boom appears to have failed to spike to a +10% inflation rate for election day, where my expectations were that it could have ranged to as high as +12% for an outright majority 30 seats inducing result as my long-standing analysis of seats vs house prices trend trajectory forecast. The updated election seats trend graph suggests that the Conservatives are on target towards achieving a single digits outright majority which is completely contrary to every opinion poll published this year. Which if it materialises then I am sure for Election 2020 everyone will be staring at the house prices indices rather than the opinion polls. Though as is usually the case that when the consensus becomes focused on an particular indicator then it usually stops working.